The painting on the right is by Piero della Francesca. It is a portrait of a soldier and his wife done in 1474. 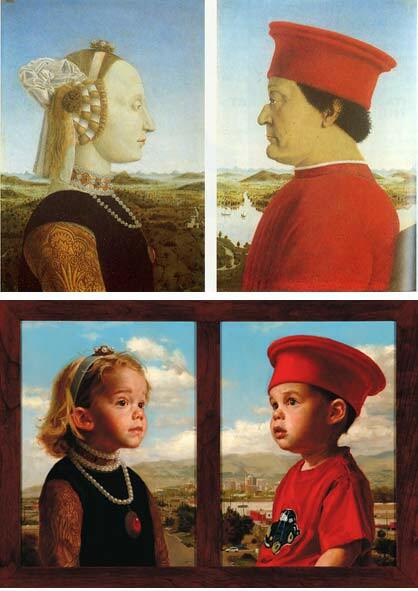 I saw it in an art history book one day and thought it would be a riot to do a version of it using my toddler twins (lower right). I gave it to my wife for mothers day. I saw this painting last night and was overwhelmed by the sheer creativity of your mind!!!!!!!! It is fabulous…..as are all your other paintings! wow, your babies aren’t babies any more! you have done some fantastic work! my little family has enjoyed all of it…but I especially loved this idea…and way to go, giving it to the mother of the darlings! we were sorry to see that we just missed one of your shows, since we only live a few blocks away. keep doing work you love, so you won’t get bored, and we’ll get to see more for years to come! Your art inspires me to paint again. Amazing stuff. You’re truly talented. This is sensational, like really wow! I Love that! You are so creative! Hats off, this is pure gold. Love those kids!!! Where do I make comments on the hott women on your page, Ashley and Jen??? Jeff, you rock man, I mean you are really hitting it. Your paint quality, your approach to the market, the school you guys are running, bravo. I would be pleased to meet you guys next year when I am touring though your direction. Keep going you are makin’ it buddy!